- After a lengthy series of introductory cut scenes you’ll gain control of Bartz, the main character of Final Fantasy V. At this point Bartz can only attack, defend, and use items, and that’s plenty for now. - Head east on Bartz’s chocobo and enter the Meteorite (you don’t have much choice in the matter) and, after a bit of wandering. 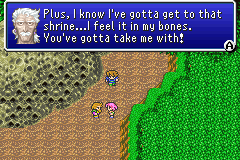 talking, and basic combat, Bartz will be joined by Lenna and Galuf. At the moment they’re almost identical to Bartz; this will (probably) change soon. They don’t join you immediately, but it won’t take long. - Before leaving the Meteorite, check to the southeast of the massive rock. You can walk through the trees to find a Phoenix Down. - Head north after saving Galuf and Lenna. After ditching Boko you’ll wind up in the first ‘dungeon’ of the game, albeit a really short one. Head north and you’ll start running into random battles; there’s not much point grinding yet, so don’t linger in here too long. There’s a healing spring up here, as well as a door. - … is a pirate’s base. Huh. There’s nothing you can do here right now, so head north and cross the long pier on your right to find a pirate ship. You can head belowdecks, but there’s no point. Head to the wheel in the north (rear of the ship) to trigger several cut scenes. Once they’re done you’ll have another new party member, Faris, as well as the pirate ship itself. You can now explore ‘the world’, though you’re contained to a fairly small area. There’s still little point in grinding, even though you now have a full party, and though you have a town to visit in the south it’s better to proceed directly to the next dungeon. It’s another small one, and the prize for besting it will allow you to begin developing your characters. Allow the pirate who offers to steer the ship to send you straight there. - 1F. No enemies down here. There’s a healing pot on your left, and one of the men here will give you five Potions. Head up the stairs on the right. - 2F. There’s a Tent to the far west and a doorway to a save point in the middle. Passing through the save room will take you to a split hallway in the south; the right stairs lead to a Leather Cap, the left to the continued path. - 3F. Loop clockwise around the area and you’ll see a monstrous NPC in the middle. Check the door to the left of the monster to find a Broadsword, equip it on someone for extra damage (Galuf, probably, as he starts the game unarmed) and approach the boss of the Wind Shrine. The first boss is also an easy boss. When its wings are spread, Wing Raptor will hit either one target or the whole party for light damage. When it closes its wings it will counterattack any attacks with Claw, which is moderately painful - but still not that bad. Hit when its wings are open, heal when they close. Simple. Wing Raptor drops a Phoenix Down when destroyed. - 4F. In the southeast corner of this final floor you can find a Staff hidden in the wall. Enter the door in the middle of the room for a cut scene and you’ll find a warp square out of the Wind Shrine - and you’ll have the Knight, Monk, Blue Mage, Thief, Black Mage, and White Mage crystal fragments to show for it. This unlocks the primary combat mechanic of Final Fantasy V, the job system. Each crystal fragment you find in Final Fantasy V contains within it a job which you can bestow upon one of your four characters. When a character assumes a job via the Job menu they take on the special Abilities and attributes of that job. A Knight, for example, possesses strong martial skills, and can use Cover to protect characters who are low on health from enemy attacks. A Black Mage, by contrast, uses black magic to inflict mass amounts of damage to their foes, but is physically weak. In order to build a balanced, effective team it is essential to use jobs, as they offer options above and beyond that of the base Freelancer job, which offers virtually nothing besides the ability to equip whatever you like. Jobs are not static. As you fight enemies you will gain ABP in your equipped jobs. Gain enough ABP and that job will level up, potentially granting you a new Ability. Abilities are special commands or capabilities which may be equipped on their respective characters even after that character has switched jobs. As such it is possible for, say, a Knight to fight effectively barehanded like a Monk, or for a Black Mage to use restorative magic. Characters may only equip one Ability at a time, so mess around with your Abilities as you gain new ones to see which work best with a character's current job. Do not leave a character in a single job for too long. Yes, your Black Mage may seem awesome now, but your characters will ultimately be much stronger if they’re allowed to diversify over time, and you’ll gain the ability to cope with a variety of different situations. There are many ways to complete Final Fantasy V with the jobs you’ll acquire, and you won’t know which play style you like most unless you experiment.